Welcome to Fisher’s Auto Service in Kirkland, WA. We are proud to be your local Auto Repair experts since 1979. As the premier auto repair shop in Kirkland, our highly trained automotive technicians take pride in all of their Auto Repair efforts so you don’t have to worry. We are a full service auto repair shop that provides a wide range of automotive services. Each and every one of our reliable specialists undergoes extensive ASE automotive repair training, including advanced certification in Transmission Repair, Engine Repair, Brake Repair, Auto Air Conditioning Repair, Tune-ups and Oil Change Service. Our reputation has been built on our ability to solve complex mechanical issues, as well as repair your vehicle bumper to bumper. No matter your vehicle needs, our team at Fisher’s Auto Service will be glad to provide trustworthy, and reputable service. We are grateful to offer reliable vehicle care to Kirkland residents, as well those just driving through. Simply put… We are the Best Auto Repair in Kirkland, WA! And our pledge to you our customer is straightforward: We Guarantee you will be 100% satisfied with our auto repair service! If you have any concerns, call us any time at (425) 823-4441 and speak to one of our service writers. We also offer a free scan of the on-board diagnostics (OBD) on your car to read the diagnostic trouble codes (DTCs) when your “Check Engine” light comes on. 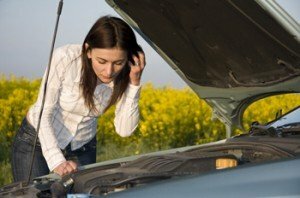 It is important to get this information as soon as possible to prevent damage to your engine. You can rest assured that our ASE-certified automotive technicians will be able to accurately diagnose the problem and recommend the appropriate solution to return your car to proper working condition. We specialize in providing preventive maintenance, also called routine or regular maintenance, which includes an oil change, tire rotation, and inspection of brakes, fluids, lights, wiper blades, tire pressure, air filter and battery. By monitoring all of these areas of your car, we can make sure there are no hidden problems that could cause a part or system failure. Proper maintenance of your car at frequent intervals will extend the operating life of your car and help you avoid costly repairs associated with worn-out parts. We also provide the more extensive major service that automotive manufacturers recommend at 15,000, 30,000 and 90,000 miles in order to maintain your car in good working condition. You may have heard the term “tune-up” to describe routine maintenance. That term applied to cars before manufacturers implemented modern computer controls in cars and made other improvements in engine technology. Some of the services that were done for a tune-up are no longer necessary, and others are performed as part of the scheduled preventive maintenance. Feel free to ask us for more details on the differences between an old-fashioned tune-up and the current services for preventive maintenance. 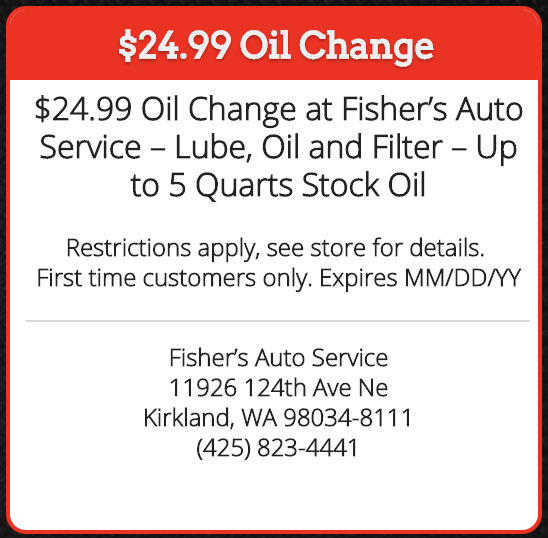 No matter what your vehicle needs, come see us at Fisher’s Auto Service in Kirkland, WA today! From Brakes to transmission to engine work, we are the best one stop auto repair shop in Kirkland. We are proud to offer an in-house warranty. We provide trustworthy, fast, reliable, and quality work at the right price. Come see us for any of your auto repair needs at 11926 124th Ave Ne Kirkland, WA 98034.